"1 photograph; 12.6 x 17.3 cm. 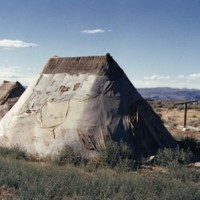 Large canvas material over beams set up near river. (Another one of these objects in background also)." "1 photograph; 7.8 x 11.3 cm. 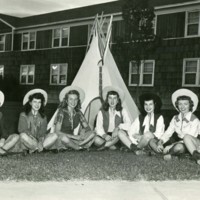 Women posing for a picture in front of tent with cowboy hats on."